“Early one Tuesday morning several men removed the whitewash from a shop window at 3 Western Parade, Aberystwyth, and revealed an attractive Christian Book Shop. Children going to school at 8.30 looked through and said ‘Look at those men praying in there’. The date was May 7, 1974. “A number of Christians from Alfred Place Baptist Church had discussed the project for several years and made various enquiries. Now their plans had finally come to fruition. In the previous year they had witnessed the followers of the Guru Maharaji opening shops in Aberystwyth to sell health foods, hand crafts and their misleading literature. They had seen four Marxist students selling communist papers in the main streets on Saturday afternoons. They had had the so-called Jehovah’s Witnesses calling regularly at the doors with their magazines. But what were Christians doing? “This concern weighed on their hearts increasingly. When some shops owned by British Rail went empty, they made application for their tenancy. The response to the first inquiries was not encouraging, as the shops were already promised to other parties. But the months went by and the premises remained empty. “Finally British Rail wrote to all who had expressed interest in the shops and asked for tenders. The Christians involved in the earlier application sent in a tender and there was loud rejoicing when they learnt that British Rail had accepted it. April saw the beginning of intensive and enthusiastic activity. The shop was dilapidated; the back window had no glass and a broken frame and the skirting board had dry rot. “Then old talents were displayed and new gifts came to the fore, especially among the deacons. One decorated and painted the inside, an electrician re-wired the shop, another carpenter obtained wood from an old school and a lecturer helped him in its painting and preparation. A fifth deacon designed the shelving, while a sixth painted the sign. At remarkably low cost the shop was transformed. “One of the church elders, who was a lecturer in the College of librarianship, took initial responsibility for the business side of ordering books. Most Christian publishers proved helpful, especially the Banner of Truth Trust. So read the news account in Evangelical Times, July 1974. The location of the Western Parade lock-up shop was a good one: next to the railway station, with local and regional buses parking outside. One (and later two) display windows, kept lit at night, all in what started out as a row of 8 shops. The Book Shop’s closest neighbour was a Poodle Parlour, where small canines were groomed, and noises of barking could be heard by the book browsers through a thin separating wall. That last fact was a blessing in disguise: sometime around 1979 the Poodle business departed, and application was made to the Landlord for the Book Shop to expand, doubling the shop’s size. This application was successful, so once again hammering, decorating and installing shelving took place. It was discovered that there was already a lintel in the connecting wall, and a previous way-through was discovered behind our bookshelves, and opened for use again. Though numbers 3 and 4 Western Parade gave us a building for twenty years, it had some unsuitable features: an ancient structure with damp walls, a leaking roof, and plagued by coal-yard dust (especially when the wind blew from the east). Building re-development of the old railway sidings and coal yard had been talked about for many years, and one by one the shops closed with no further tenancies allowed. The unoccupied shops were boarded up, and in the early 1990s half of them were demolished. The boardings attracted graffiti (and also some more pleasurable murals), and we suffered a number of break-ins at night by youngsters looking for money. We even had to call the police out on Christmas day in 1992 to investigate. By late 1991 just two shops remained open, ourselves and Griffiths y Glo (a coal merchant). For some years we had searched but found that alternative premises for rental were very expensive and in short supply. The possibility of building a new shop on land adjacent to the Alfred Place Baptist building itself was not seriously considered, as on an earlier investigation we had been advised that this would be rejected. However, a new application was made, and was successful in 1992. At a members meeting on 5th February 1992 it was resolved to proceed with this new building project and to start looking to Christian people for the necessary funds. 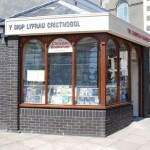 In fact the foundations were dug in March 1992.
stian Bookshop for the sale of evangelical books ever to be opened in Wales. We expected the new shop to cost in the region of 25,000 Pounds, and as 1992 was the centenary year of the death of Charles Haddon Spurgeon we observed then that a mark of inflation was that the expected cost of the Book Shop was almost the same as Spurgeon’s congregation had to raise to build the first Metropolitan Tabernacle, some 131 years before! In the event, our shop costs have been in the region of 40,000 Pounds, but with generous gifts and loans, plus the successful trading of the shop since 1994, the monies will all be met by April 2000. Even unbelievers have commented favourably on the design of the new shop, and the way the windows and perspective harmonise with the adjacent church (chapel) building, whose Victorian upright elegance has dominated the tiny street called ‘Alfred Place’ (the origin of the name is unknown) since the chapel’s construction in 1870. Craftsman’s use of wood is striking in an age of plastic, from the hardwood windows with their semi-circular tops to the internal shelves and cupboards. Our new location is adjacent to the town library at present, though that Carnegie building is frequently the subject of plans to re-locate. The main shops in the town itself are now much closer, and the local Eastgate shops are improving: the tourist information bureau is nearby, and summer visitors usually find us easily. The medium of reading this document, if you are doing so on the Internet, is itself surely a token of an impending trend away from buildings to the electronic ‘virtual Christian Book Shop’ of the next millenium: we hope to be part of that, though the very feel of the paper and binding of a sound Christian hardback will remain important and will need the existence of physical buildings like ours for people to browse and choose. 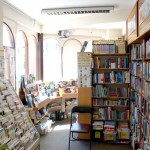 The important precursor of our shop was the bookstall in the vestibule of the church, begun in the mid 1960’s soon after the call of Geoff Thomas to be the Minister. A young student deacon was the catalyst and books were obtained from one of the then about half-dozen Christian Book Shops around Wales run by the Evangelical Movement of Wales (they now run 8). The one still today in The Arcade in Wrexham supplied the books to us by means of a parcel delivery service using the Crossville country buses. This continued in the 1970’s with books supplied such as Truth Unchanged, Unchanging (Lloyd-Jones, five shillings); Welsh revival of 1904 (Eifion Evans, twelve shillings and six pence); and What’s wrong with preaching today? (Al Martin, one shilling and six pence). Our convictions over sound books meant that those produced by the Banner of Truth Trust were top of our list, followed closely by the growing value of the Evangelical Press and many titles from Presbyterian and Reformed. In 1974 when the Book Shop started, British currency had changed to Pounds and Pence, but prices sound strange in today’s equivalents: Life in the Spirit, Lloyd-Jones 2.50 Pounds; God made them great, Tallach 1.25 Pounds; The reformed Pastor, Baxter 65 pence. The Banner title John Elias had just been published (at 2.10 Pounds) and Banner Magazines were 10 Pence each! 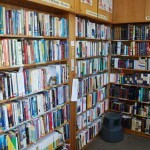 Do sound Book Shops lead to sound authors? In our case ‘yes, they can indeed do so’. I have a photo taken outside Western Parade in Spring 1975 showing a theological student doing a Saturday stint opening the shop. After faithful ministry in Belfast, preaching, writing and now theological lecturing in the USA, we always stock his most valuable books, six of which are available at present – we send our greetings to Derek Thomas, wish him and Rosemary God’s blessing on all their works. Bryntirion Press (formerly Evangelical Press of Wales) has published Geoff’s recent volume on Daniel, and also continues to make available some of the (all too few) sound books there are to stock in Welsh. The drive and enthusiasm of our young Pastor Geoff Thomas was responsible for the start of this work. 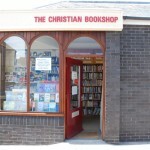 The link to a sound gospel church with a dedicated membership and many regular attenders swelled in number by the students in the University and Colleges of Aberystwyth made a Christian shop possible even in a tiny town serving little more than a population of 12,000. The volunteers who started the work were soon joined by the Welsh language sister congregation, the Welsh Evangelical Church, and students such as Derek and Rosemary in the mid 1970’s have had many dedicated successors. In fact we are now seeing the children of some of these students helping in our work, so one generation’s faithfulness has lead to another. I remember the day Geoff and I drove on a return trip to London to purchase an initial stock of books from a wholesaler in Bromley, and also the trip a few months later with Eric Taylor to a supplier in Treorchy. In a typical year there are about 250 consignments of books, each to be selected, ordered, received, unpacked, checked, priced, shelved, arranged, displayed, and finally paid-for. In addition, there are the many customer requests to trace and obtain. And, as a small business, there are expenses and maintenance to cover, as well as annual accounts, these tasks are faithfully done in a corner of a room in someones home. ng some carpentry skills, the ‘Clerk of Works’ (Mr Ron Loosley) said that with planing and sanding they would be like new. The ‘Supervisor of refurbishing’ (the late Aubrey Davies) said that “they would look better with a coat of paint”, and the shelves were finally installed for use. Paid staffing was experimented-with on a part-time basis for several years during the 1977 to 1979 period, but turnover never generated enough income to continue this scheme. A student has been paid each summer for 6 weeks, and has given the regular staff an invaluable break then. How many people have been involved in running the shop? I wish we had kept records of this: just the last 5 years in the new building has involved 33 people I can readily remember, so over the 25 years it is likely to have totalled nearly 100. I wish we could thank them all. Some have gone to glory, of course: Harry Thomas, Geoff’s father, used to go the bank for us regularly, and always had a cheerful word to say as he came into the shop and opened up the safe. Stephen Olyott, a church Deacon, was always most supportive, and helped in his area of work with our accounting and tax payments. Staffing has always attracted more women than men, but so many have freely given their time so often that the Book Shop has become a part of the lives of many of us. The dearth of good books and greetings cards in the secular shops of the town has provided us with many regular customers: children, young people, students, pensioners, men and women, friends from overseas. We supply Sunday School materials and Bible reading aids to many in the town and the surrounding country area. However, it may well be the shop staff who buy the most! In the summer, visiting Christians encourage us with their custom and often with their complimentary comments. The annual conferences of the Evangelical Movement of Wales are always held here, and to have almost 2,000 people over the two conference weeks makes it our busiest and nicest time in the shop, especially when the main conference speaker is also an author! For several years we attempted an evangelistic bookstall at the local agricultural show, where our tent was in some contrast to the selling of tractors and the parading of Welsh Cob ponies and majestic shire horses. But we have the majestic Saviour to parade before men, do we not! Now that we can no longer find a suitable place to preach in the open at the annual November fair days in the town, a bookstall is taken there, and has been well received and supported last year. At least one customer has discovered our shop and church by our presence on the Internet, though we still do not have a telephone in the shop. Use our website to see the map of where we are if you are ever visiting us. The four ingredients of a Book Shop project like ours are only sufficient if it is all done in total dependence on God, and trust in His Son, Our Saviour, as we believe it has. When discussing the start of the shop in an early church meeting we said how important it was for the shop to maintain its witness to Biblical Christianity, even if the church departed from it (and vice versa). Happily, neither has departed, and we aim to do everything in submission to Christ, His Gospel, and to the whole Word of God. We have planned a Thanksgiving Service on Saturday May 8th 1999, as the nearest convenient time to our opening date of Tuesday May 7th, twenty-five years before. Geoff Thomas will preach in Alfred Place Church, and afterwards there will be refreshments in the schoolroom and a display of photographs From Western Parade (1974-1994) to Alfred Place (1994-). We may even have on display our ancient wooden manual cash till with its warning bell, now replaced by an electronic till at last!